Recurve bows are always easy to assemble, since it’s just a matter of attaching the limbs and then stringing the bow. 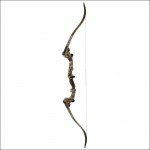 The PSE Silver Snake is no exception, and the one-piece design eliminates the need to attach limbs to the bow. However, it would be nice if PSE included a bow stringer to keep the process consistent and safe. However, with a light draw weight of only 22#, the Silver Snake is easy to string for an adult. If you’ll be teaching your child to string the bow, though, I’d recommend investing in a bow stringer for him or her. How Powerful and Accurate is the Snake? With a draw weight of only 22#, the PSE Silver Snake is not very powerful. Its power is terrific for the archery range or aerial target shooting, but it won’t sling the arrows with enough power to penetrate much of anything. Once I’d gotten the feel for the bow, the PSE Silver Snake was as accurate as any of my more expensive bows. From 25 yards, I was able to maintain 2” groupings. Unfortunately, the Silver Snake lacks bushings for attaching a sight or stabilizer, so accuracy beyond 25 yards fell off pretty rapidly, allowing only 4” groupings from 40 yards. Is The Snake Suitable For Hunting? The PSE Silver Snake isn’t made for hunting; it’s made for target shooting. 22# of draw weight won’t allow the use of heavy arrows with broadheads, and won’t provide any penetration power for taking down game. If you’re looking for an inexpensive hunting bow, you should keep looking. However, if you want something that you can take out even in poor weather to improve your skill and practice aerial target shooting, the PSE Silver Snake is the perfect match for you. Is The Bow Suitable For Beginners? PSE’s Silver Snake is perfect for beginners, since its simple, lightweight design allows them to practice for hours without getting tired. As long as you use a bow stringer to make the stringing process safer and more consistent, your beginning archer can get years of use out of the Silver Snake. I like to keep mine around as an extra bow for friends who want to try it out, but don’t want to invest a lot of money in the hobby until they know if they’ll enjoy it. The Silver Snake is a sturdy little bow, so I don’t have to worry about it being damaged when one of my beginner friends drops the bow. Does This Recurve Accept Accessories? Since it isn’t drilled and doesn’t include any bushings, the PSE Silver Snake does not accept accessories out of the box. An archery shop could probably drill the holes and install a sight, stabilizer, or Berger button for you, but I didn’t really look into that, since I prefer natural shooting. You can use just about any arrows with this versatile, almost indestructible bow. The bow does not come with any arrows, unfortunately, but my Easton Carbon ION arrows with field tips worked great with the PSE Silver Snake. I’ve also used heavier aluminum arrows with the Silver Snake, without any problems. If you’d like some help picking out arrows, check out our guide on choosing arrows. Is This Bow Comfortable To Hold? At a weight of around 2 pounds, the PSE Silver Snake would likely be comfortable to hold even if its grip was poorly designed. Fortunately, the grip is very comfortable and the bow seems to become an extension of my arm whenever I’m holding it. Hours of shooting feel like minutes, with very little fatigue or muscle soreness. There isn’t much to go wrong with the PSE Silver Snake, because of its one-piece design. The bow is darn near indestructible, from my testing. I’ve dropped it on concrete, dirt, grass, and even in a puddle without any ill effects. The only weak point in this bow is the string. The included string wore out pretty quickly, but the bow accepts just about any strings and, quite frankly, I expected the string to wear out when I saw how little I paid for the bow. What String Fits The PSE Silver Snake? 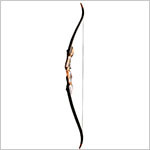 Any 22# bow string will fit the PSE Silver Snake. I didn’t try any heavier strings, since the bow is only available in 22# from the manufacturer and the limb tips don’t appear to be reinforced. Is The PSE Silver Snake a Heavy Bow? The Silver Snake is only 2 pounds heavy, so no; it isn’t a heavy bow at all. 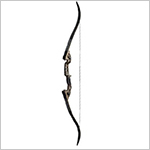 Its lightweight, one-piece design makes the bow easy to hold even for long periods of time. How Loud Is This Bow? I would probably rate the Silver Snake as average, in terms of loudness. I’ve definitely heard quieter bows, but I’ve heard bows that were much louder, too. There is no room for parts to wriggle around on this bow, since it’s a one-piece design, so the majority of the noise is from the string snapping forward. Thanks for reading our review of PSE’s Silver Snake. If you’re looking for an inexpensive but sturdy and accurate bow for target shooting, the PSE Silver Snake makes an excellent choice. Take a look at Amazon.com’s great price on the PSE Silver Snake if you’re interested.